Majestic Mount Rainier soars almost 3 miles (14,410 feet) above sea level and looms over the expanding suburbs of Seattle and Tacoma, Washington. Each year almost two million visitors come to Mount Rainier National Park to admire the volcano and its glaciers, alpine meadows, and forested ridges. However, the volcano’s beauty is deceptive—U.S. Geological Survey (USGS) research shows that Mount Rainier is one of our Nation’s most dangerous volcanoes. It has been the source of countless eruptions and volcanic mudflows (lahars) that have surged down valleys on its flanks and buried broad areas now densely populated. To help people live more safely with the volcano, USGS scientists are working closely with local communities, emergency managers, and the National Park Service. 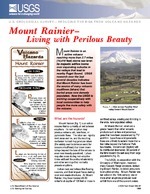 Scott, Kevin M., Wolfe, Edward W., Driedger, Carolyn L., 1997, Mount Rainier–Living With Perilous Beauty: U.S. Geological Survey Fact Sheet 065-97, 4 pp., https://pubs.usgs.gov/fs/1997/0065/.